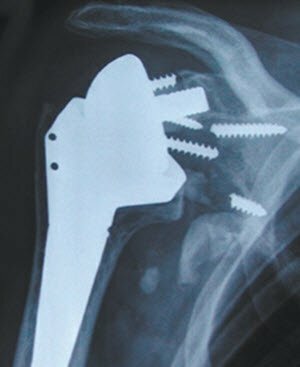 The authors discuss an alternative style of prosthesis that provides increased lateralization of the center of rotation in reverse total shoulder arthroplasty. This prosthesis allows for (1) a larger arc of motion before prosthetic bone impingement; (2) less alteration of the native glenohumeral anatomy; and (3) preservation of the anatomic neck angle of the humeral component. Reverse total shoulder arthroplasty (RSA) has evolved from a long line of clinical trials and failures. 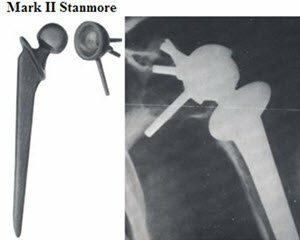 Early designers attempted to recreate the glenohumeral joint’s normal anatomic center of rotation, but were met with high failure rates due to over-constraint and inadequate glenoid fixation. 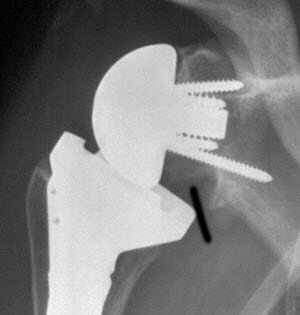 Following dismal results with the Mark shoulder prosthesis, Dr. Charles Neer concluded that constrained arthroplasty was not a predictable solution for the treatment of cuff tear arthropathy (Figure 1). Figure 1. Mark II constrained shoulder replacement designed by Dr. Charles Neer. Radiograph demonstrates glenoid-sided osteolysis and subsequent failure, commonly attributed to the significant sheer forces across the bone-impant interface. In 1985, Dr. Paul Grammont published his first series on the use of his RSA design. He reported that medializing the glenohumeral center of rotation to the face of the glenoid decreased sheer forces across the glenoid, improving survivorship of the implant (Figure 2). Figure 2. Radiograph depicting Grammont style prosthesis with medialized center of rotation and non-anatomic valgus neck cut. Note the significant distalization and medialization of the greater tuberosity in relation to the acromion. 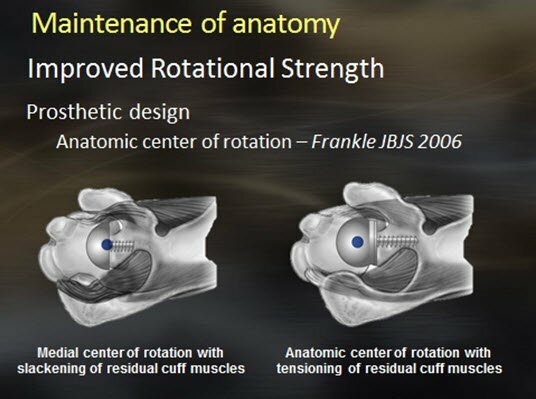 Grammont also hypothesized that distalization of the center of rotation was necessary to improve deltoid function by increasing the resting tension, increasing muscle recruitment, and decreasing the lever arm. This concept has remained the cornerstone for RSA device development for most manufacturers to date. Althought these principles provide one method for predictably improving function in patients with rotator cuff incompetence, problems have been recognized. Most notably, scapular notching occurs from medializing the center of rotation and using a non-anatomic articulation (Figure 3). Further medialization of the humerus occurs from the use of non-anatomic valgus humeral component to improve stability of the prosthetic interface. Figure 3. AP radiograph demonstrating Sirveaux grade III notching from scapulohumeral impingement. In this patient, the glenoid component has become loose. Note the radiolucencies around the superior screw and central peg. This divergence from Grammont principles thus defined the emerging debate: which is better, medialization or lateralization? The answer; unfortunately, is not so simple. Lateralization of the center of rotation is just one small piece of a much larger picture. How does one recreate the normal anatomic relationships of the complex muscular and osseous structures around the glenohumeral joint with the use of a radically non-anatomic prosthesis? The functional interplay of human anatomy is so complex and precise that it is impossible to deviate from normal anatomy and expect a gain in function. This is the basic principle behind the development of the lateralized reverse prosthesis. Grammont recognized that medialization of the center of rotation had the deleterious effect of detensioning the deltoid because of the loss of the normal wrapping that occurs around the anatomically positioned greater tuberosity. Because of inherent mechanical constraints of the Grammont-style prosthesis, improved deltoid tension could only be achieved by distalizing the center of rotation. Unfortunately, significant distalization is not without trade off. The brachial plexus can be stretched and increased dead space can occur, possibly contributing to postoperative neurologic lesions and increased infection rates, respectively. Use of a lateralized sphere allows the surgeon to gain stability of the shoulder in a manner different from that achieved with a medialized prosthesis. Lateralization of the center of rotation ultimately places the lateral edge of the greater tuberosity in a near anatomic position. Recreation of the tuberosity to glenoid distance and acromial-tuberosity offset places the remaining rotator cuff under physiologically appropriate tension, thereby recreating the compressive effect of the deltoid due to its wrapping around the tuberosity. This increased stability allows for a more varus humeral prosthesis, further decreasing the risk of scapulohumeral impingement. In a biomechanical study by Virini et al, varus humeral cut was the most important factor in reducing the likelihood of scapulohumeral impingement, followed by inferior baseplate position and lateralizing the center of rotation (Figure 4). This concept has also been supported clinically, with rates of scapular notching reported between 50% and 96% with a medialized RSA prosthesis and 0% to 10% with the use of a lateralized prosthesis. Figure 4. Diagram demonstrating differences in scapulohumeral relationships when comparing an anatomic neck cut versus a valgus neck cut. The increased propensity for scapulohumeral impingement following a valgus neck cut is clearly demonstrated. Inferior glenosphere positioning and tilt can be utilized regardless of center of rotation; however, varus neck cut is not compatible with a medialized prostheses due to an unacceptably high rate of prosthetic instability. Figure 5. Image depicting the difference in anterior and posterior rotator cuff tensioning as it relates to the center of rotation of the glenohumeral articulation. Lateralizing the center of rotation helps restore the resting tension of the remaining anterior and posterior rotator cuff. All of these complications are affected by prosthetic design. Figure 6. Radiograph demonstrating catastrophic baseplate failure due to osteolysis. Scapulohumeral impingement and subsequent scapular notching is thought to lead to secondary osteolysis through the generation of polyethylene wear particles. Instability rates are reportedly low with both prosthetic designs; however, biomechanical testing suggests that improved stability is achieved with increasing lateral offset, depth of the socket, and impingement-free arc of motion. 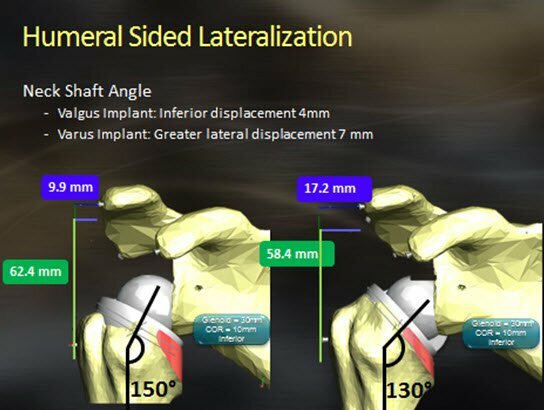 Lateral offset and impingement-free motion depend on sphere size, radius of curvature, and center of rotation, while socket depth is independent of the center of rotation. Because of the increased forces across the glenoid-baseplate junction seen with the use of a lateral sphere, secure rigid initial fixation is important. The baseplate should be implanted with maximal compression and secured with peripheral locking screws. Glenosphere size can directly impact intraoperative motion and ultimately postoperative motion. Smaller spheres should be used in smaller patients to prevent over-stuffing. Utilization of a lateral offset sphere coupled with a varus neck cut places the shoulder in a near anatomic position. The subscapularis is usually repairable unless ruptured and retracted. The authors advocate repair of the subscapularis to restore the force couple of the remaining rotator cuff. Be aware that deviations from normal anatomy will have adverse effects. Inferior placement of the glenosphere may help to reduce notching, but may increase deltoid tension and risk of scapula fracture. Central placement of the glenosphere may reduce risk of scapula fracture, but will likely increase the risk of scapulohumeral impingement. All reverse shoulder prosthetic designs have inherent strengths and weaknesses. Center of rotation is one small factor in determining the function and stability of a RSA reconstruction. Regardless of which system is chosen, it is important to avoid significant alterations in anatomy to prevent complications and to maximize function. Brandon Steen, MD, is a shoulder and elbow specialist with Florida Orthopaedic Associates, DeLand, Florida. Michael Hussey, MD, is a shoulder and elbow specialist with Arkansas Speciality Orthopaedics, Little Rock, Arkansas. Mark Frankle, MD, is a shoulder and elbow specialist with the Florida Orthopaedic Institute, Tampa, Florida. Day, J. S., MacDonald, D. W., Olsen, M., Getz, C., Williams, G. R., & Kurtz, S. M. (2012). Polyethylene wear in retrieved reverse total shoulder components.Journal of Shoulder and Elbow Surgery, 21(5), 667-674. 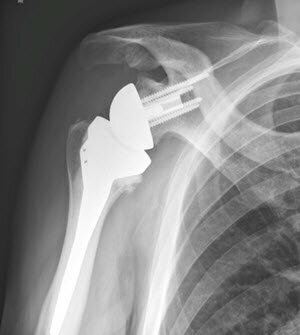 Virani NA, Cabezas A, Gutiérrez S, Santoni BG, Otto R, Frankle M. Reverse shoulder arthroplasty components and surgical techniques that restore glenohumeral motion. J Shoulder Elbow Surg. 2013 Feb;22(2):179-87. doi: 10.1016/j.jse.2012.02.004. Gagey, O., & Hue, E. (2000). Mechanics of the deltoid muscle: a new approach. Clinical orthopaedics and related research, 375, 250-257. Gutiérrez, S., Keller, T. S., Levy, J. C., Lee III, W. E., & Luo, Z. P. (2008). Hierarchy of stability factors in reverse shoulder arthroplasty. Clinical orthopaedics and related research, 466(3), 670-676. Cuff D, Clark R, Pupello D, Frankle M. Reverse shoulder arthroplasty for the treatment of rotator cuff deficiency: a concise follow-up, at a minimum of five years, of a previous report. J Bone Joint Surg Am. 2012 Nov 7;94(21):1996-2000. doi: 10.2106/JBJS.K.01206. Next articleIs There a Benefit to Using PSI in a Total Knee Arthroplasty?